• NKST An untidy structure of sticks, lined with finer material, in the top of a tall tree. 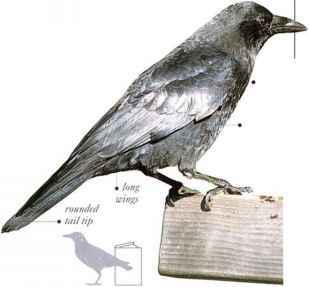 I his glossy black bird with its rounded tail and steady, flapping flight is a familiar sight in open country throughout North America. In farming areas its habit of feeding in flocks on corn and pea crops has earned the American Crow a bad reputation. 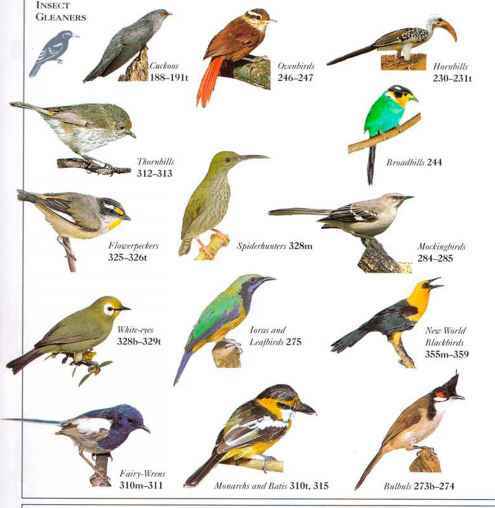 The diet also includes nuts and fruit, insects, and small animals such as young birds and mice, and sometimes carrion. During the breeding season, the birds nest either in separate pairs, or sometimes in small colonics. At other times of the year, thev congregate in large communal roosts for the night, dispersing during the day to search for food. 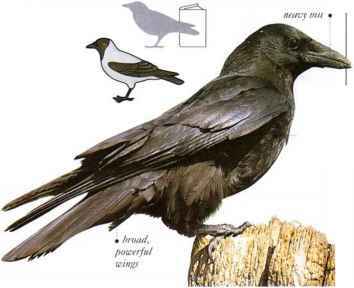 The usual call is a harsh "caw," but as in other birds there arc other call notes, each one used to convey a particular meaning. • NEST a large, cup-shaped nest of sticks, with a soft lining of finer plant material, in a tree or a bush, or on top of a telephone pole. DlSTRlRi TION Much of North America.